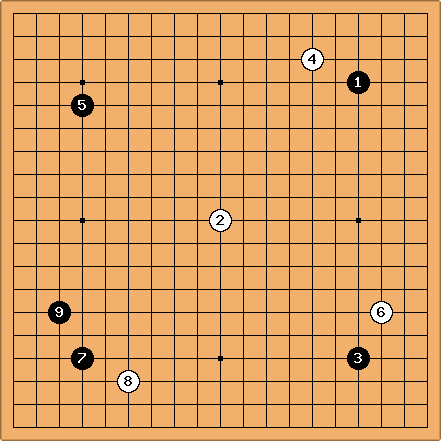 A position is the arrangement of black and white stones on the go board. Position is a term used in different contexts, like positional judgement or the restriction for repetition of a position in superko rules. The term position may also be used to refer to the distribution of stones on a specific region of the board. To avoid ambiguity one may refer to a local position or a whole board position, where appropriate (as in a superko rule). Given a grid graph? G = (V, E), the position consists of the color information of all vertices (intersections), where the color can be "black", "white", or "empty". A position can either be legal or illegal. A position is legal if and only if no strings of stones that have no liberties exist. On the ``19×19`` board, there are ``361`` intersections. Since each of these can be either black, white, or empty, there are ``3^361 approx 1.74 × 10^172`` possible positions on that board. Not all of them are legal, as some of these positions contain stones with no liberties. In recent research, John Tromp and others have calculated the exact number of legal board positions that are legal. This number is about ``2.08 × 10^170``, or approximately ``1.2%`` of board positions are legal. See also: Number of possible go games.